Batter and Beat: What's better than a four-leaf clover? I know I'm in the minority when I say that I just don't like beer. In fact, I don't believe that I have ever been able to consume one single bottle or full glass of beer. Gin has always been my spirit of choice. My husband Kevin on the other hand, is an avid beer fan - Guinness being one of his favorites. Now I have heard that stout beer, when paired with chocolate really enhances the flavor and what better time to test out this theory than for St. Patrick's Day? The original recipe, (which you can view on www.smittenkitchen.com) also contains a little pocket of ganache, which I omitted since I did not have any whiskey on hand. Preheat oven to 350°F. Line 24 cupcake cups with liners. Bring 1 cup stout and 1 cup butter to simmer in heavy large saucepan over medium heat. Add cocoa powder and whisk until mixture is smooth. Whip the butter in the bowl of an electric mixer, or with a hand mixer, for several minutes. You want to get it very light and fluffy. Slowly add the powdered sugar, a few tablespoons at a time. Ice and decorate the cupcakes. 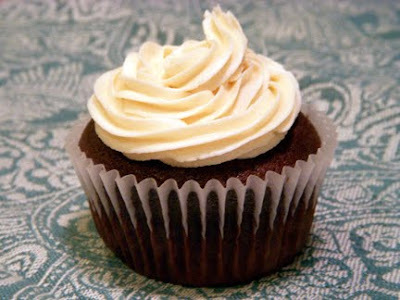 I used a piping bag with tip, though a plastic bag with the corner snipped off works just as well.